The new year gave a refreshed impetus to the construction team. 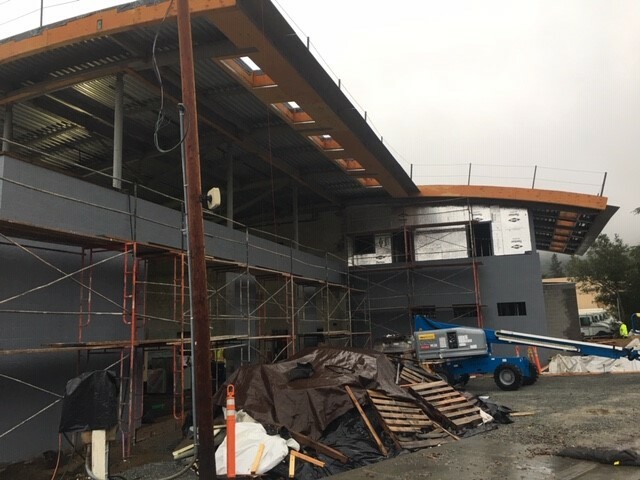 With the advantage of a watertight building, the contractor has multiple trades working simultaneously in almost all areas of the fire station. Mechanical, electrical, plumbing and sprinkler crews are installing interior rough in throughout. The metal stairs are in place, facilitating material and personnel access to the second floor. Interior and exterior insulation installation is underway. Soon, we will start seeing gyp board wall closeup. The site walls and flatwork continue to be prepared to receive concrete as soon as the weather allows. The contractor will be modifying the median on Civic Center Drive to allow for access/egress of fire vehicles to the station. The team has diligently coordinated the logistics of the work with County, Marin Municipal Water District and the City of San Rafael, and will be ready to start this work by early February.